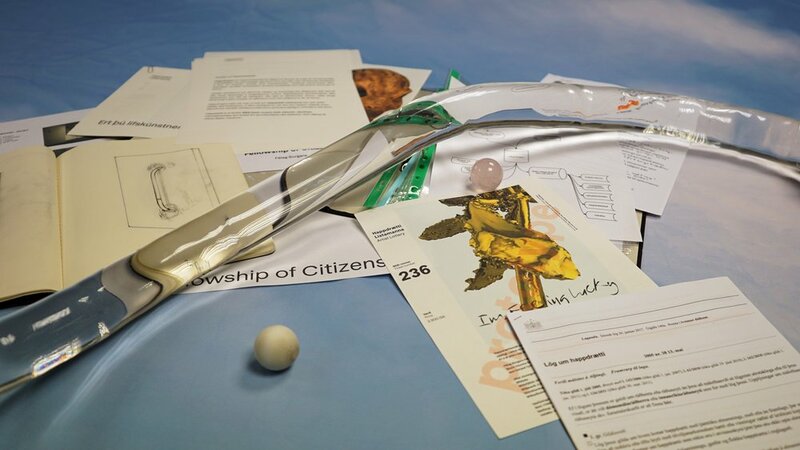 Fellowship of Citizens is London-based artist Saemundur Thor Helgason’s first solo exhibition in London. The exhibition will formally launch the interest group Félag Borgara (or in English ‘Fellowship of Citizens’) founded by Saemundur Thor Helgason in Reykjavik in October 2017, which aims to lobby for basic income in Iceland through apolitical means. Part of arebyte’s 2018 programme Islands, the interest group seeks to demonstrate the feasibility of a financing scheme which operates as an economic island, a microcosmic financial system, lobbying for basic income in Iceland. The work operates on a national scale due to legal restrictions, but financially supports BIEN (Basic Income Earth Network), an international organisation that advocates for basic income  worldwide. Fellowship of Citizens aims to fund BIEN with regular payments raised by a national lottery called ‘Happdrætti Listamanna’ (or ‘Artist Lottery’), open to all citizens of Iceland. In Iceland, the Listamannalaun (or artist salary) annually awards a given number of artists a monthly basic income for 3 months to up to 2 years. If we imagine (as Joseph Beuys did), that everyone is an artist, in some ways this could be seen as analogous minimum basic income. Bearing this in mind, the lottery campaign will address all citizens as if they were artists. Slogans include "Who creates more masterpieces at dinner, you or Warhol? ", "Embrace your inner artist", "Are you a good cook, by Duchamp's standards? ", "Who's the better karaoke queen: You or Marina Abramović?". Happdrætti Listamanna does not pose as a micro pilot for basic income but serves as a tool for hype – promoting the idea of basic income. Due to legal restrictions on small-scale lotteries in Iceland, the first prize cannot be money, or quasi-money, but must be a commodity or a service. Thus, for the inaugural lottery draw, taking place later this year, the first and only prize is I’m feeling lucky, a 100g, 18K gold artwork by the London based artist Anna Mikkola, commissioned by the interest group. Fellowship of Citizens aims to finance its activities through the lottery and generate artworks, essays, articles, films etc in collaboration with various agents in the creative economy. Rather than being a symbolic gesture addressing the lack of economic value of marginalised types of labour, the organisation aims to provide systemic change. As part of the exhibition at arebyte, excerpts from a new short film written and directed by Hawk Bjorgvinsson, Wilma (2018), will be showcased. The film is produced by Fellowship of Citizens, together with Chanel Björk Sturludóttir and Katrín Arndísardóttir. The director has been given carte blanche to make a film of their own choice, on the basis that excerpts from the film may be taken out of context to serve as non-illustrative visual material for the interest group and the lottery. Accompanying the short film, a new sculptural body of work has been produced in collaboration with photographer Berglaug Petra Garðarsdóttir and type foundry Gnax Type. Photographs, depicting behind-the-scenes of the making of Wilma, are eclectically displayed on monolithic lottery sculptures slightly elevated from the floor and which turn slowly synchronously in the gallery. The exhibition also features a new written contribution by Nick Srnicek on Abolishing the Distributaries of Value (2018). Saemundur Thor Helgason is an Icelandic artist based in London. He is a co-founder of HARD-CORE, an Amsterdam and London based art organization, developing algorithmic curatorial methods since 2011 and Cosmos Carl, an online platform that only hosts hyperlinks provided by artists and curators. Recent exhibitions and events that Helgason has taken part in include; ‘A guiding dog for blind dog’, Centre for Contemporary Art FUTURA, Prague, Czech Republic (2018), ‘Silicon Dreams’ with HARD-CORE at Harbinger, Reykjavik, Iceland (2018), ‘SuperFetish S/S’ at Goethe Institut, Beijing, China (2016), ‘Not in the Berlin Biennale’ at 9th Berlin Biennale (2016), ‘ÁVÖXTUN %’ Rate of Return at Reykjavik Art Museum, Iceland (2016), ‘CO-WORKERS – Network as Artist’ at Musée d’Art Moderne de la Ville de Paris, France (2015), ‘Vanity Fair | Demo Mode’ with Leslie Kulesh at Project Native Informant, London (2015). Since 2015, HARD-CORE teaches its own module ‘Documentation and Online Presence’ at the fine art department at the Gerrit Rietveld Academie in Amsterdam. Anna Mikkola is based in London and currently finishing her MFA at Goldsmiths. Her work explores the ways that technology alters human subjectivity and probes the boundaries of the human. Her research considers how interfaces and infrastructures format lived reality. Her work often materialises as videos and installations depicting narratives where different entities and points in time are woven together. Anna’s work has been shown in various spaces locally in London, for example ICA and Jupiter Woods, and elsewhere in Europe such as Sonic Acts in Amsterdam, INDEX 19 in Stockholm, House of Egorn in Berlin and T-Space in Milan. She has given talks, to name a few, at Goldsmiths University (London), ECAL (Lausanne) and the New Museum in NYC. Berglaug Petra Garðarsdóttir is a freelance photographer and a video maker from Iceland. She graduated from Ljósmyndaskólinn (The school of Photography) in January 2018. Her work is a variation of projects that focus on pop culture, feminism, young artist and the Icelandic music scenes. Gnax Type type foundry was founded in 2017 by Reykjavik based graphic- and type designer Gabríel Markan. Gabríel graduated from the graphic design department at Iceland Academy of the Arts in 2017 and has since worked as a freelance graphic- and type designer for various clients in Iceland, Europe and India. Hawk Bjorgvinsson is a director, producer and a screenwriter based in Reykjavik. He has directed numerous commercials for Sagafilm in Iceland. With interest in humour and drama, Bjorgvinsson aims to craft memorable characters and stories that appeal to a wide array of audiences. He directed the video for the Fæði Klæði campaign which is nominated for the Icelandic commercial awards. Nick Srnicek is a lecturer in Digital Economy at King's College London and the author of Platform Capitalism (Polity, 2016). Special thanks: Arnar Ásgeirsson, Ben Wrapson, Bob Bicknell-Knight, Bragi Árnason, Claudel Goy, Dagur Leó Berndsen, Dan Meththananda, Dagrún Aðalsteinsdóttir, Eva Þóra Hartmannsdóttir, Frederique Pisuisse, Gabríel Markan, Helgi R. Heiðarsson, Helgi Thor Jónsson, Hrafnhildur Helgadóttir, Maria Birta, Marios Stamatis, Nicolás Rojas Hayes, Nimrod Vardi, Points LND, Promo Signs, Rebecca Edwards, Rosie Beaumont-Thomas, Samúel Bjarnabogu, Sigurður Ámundason, Snorri Ásmundsson, Sólveig Sigurgeirsdóttir, Stelios Ilchouk, Studio XAG.